Last month, we reported that New Line Cinema is looking to reboot A Nightmare on Elm Street once again, just five years after their failed 2010 incarnation starring Jackie Earle Haley, which made just $63 million domestic from a $35 million budget. The project is still in very early stages of development, with no producers, writers or directors attached yet, but the original Freddy Krueger, Robert Englund, doesn't think the studio should be remaking the iconic horror franchise again. Bloody-Disgusting discovered two videos from a recent Comic Con, where Robert Englund shared his thoughts about what he would like to see next from the franchise. "You don't do remakes! I would do 'Freddy 9', you know? Or I would do 'Freddy vs Michael Myers'. Or I would do a prequel. I'd like to see 'Nightmare in the Hood'! I would! I think it'd be really interesting to do a line of, like, retro 80's hip hop ones and get a black actor to play Freddy and all the kids are, like, hip hop. Just do it the same!" The 2010 remake offered a slightly different version of Freddy Krueger than Robert Englund's original character. 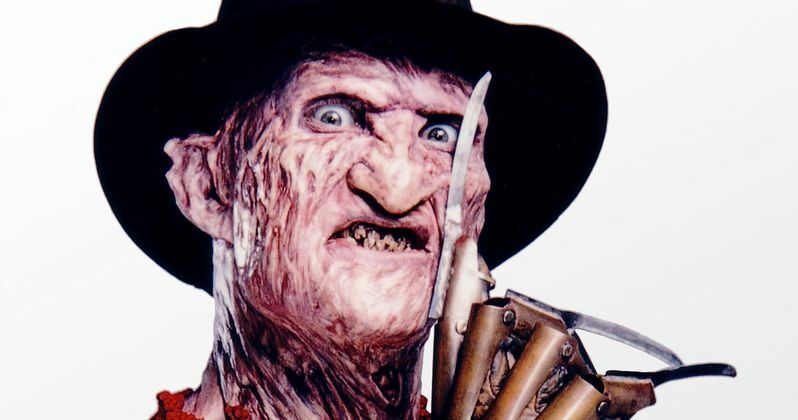 The remake portrayed Krueger as not only a child killer, but also a child molester. Robert Englund revealed that he didn't think this aspect of the rebooted character was particularly necessary, but, as it turns out, Freddy was originally supposed to be a child molester in the original Elm Street. But they changed it due to a child molestation case in Los Angeles that happened during the production. "You can imagine Freddy to be anything you want. My theory is the word 'child killer,' there's something darkly... darkly poetic about that. It's a very frightening phrase. Child killer! That should be enough. And I think there's something symbolic about being a child killer. He kills children because children are their future and there's no place for Freddy in the future. And it's revenge on the parents! It's the most painful thing a parent can do is to lose a child before they die. I mean, I can't imagine how anybody...how any adults or parents survive that, the death of a child. So that's nasty enough! Now, I'll be honest, when we did the first movie, for a while that was sort of the idea. In Los Angeles there was this terrible child molestation case going on in the news and we wanted to avoid that, so we just changed that." With the latest remake moving forward, it remains unclear what kinds of changes will be made to the iconic Freddy Krueger character, but if the producers ever decide to go with a prequel, Robert Englund would be interested in putting on that iconic sweater once again. Do you think there should be yet another remake of A Nightmare on Elm Street? Or would you rather see Robert Englund come back as Freddy for a prequel? You can visit Jimmy Finlay's Facebook page to watch both parts of his video interactions with Robert Englund.